Sister Agatha Muggli to Celebrate 50th Jubilee - Please join us on May 18! The public is invited to the joyous celebration of Sister Agatha Muggli’s 50 years of monastic profession on Saturday, May 18, at Annunciation Monastery. The Eucharistic celebration will be held at 1:30 p.m., followed by a reception from 2:30 to 4:00 p.m. in the monastic dining room. Sister Agatha (birth name Catherine) is the youngest of ten children, born to Joseph and Barbara (Schmidt) Muggli. Her great love of the outdoors was nurtured by life on the family farm near Miles City, MT. She gained a deep appreciation for life and growth. This appreciation was the beginning, and is the foundation, for her life as a Benedictine Sister of Annunciation Monastery. Despite her plan to “not become a sister,” God’s call became a whisper throughout her life. Fleeting thoughts of becoming a sister became more frequent as time went on. She contacted the Sisters of Annunciation Monastery and, after entering, it seemed like a good fit. Sister Agatha credits her piano teacher, Sister Cecile, for planting the seed to become a music teacher. She earned a bachelor of arts degree from the College of St. Scholastica, Duluth, MN. It was there that she learned to play the organ. Sister Agatha says she “learned music by teaching it, especially teaching piano.” She taught chorus at Priory High and taught school music and piano at Cathedral in Bismarck, St. Joseph’s and Christ the King in Mandan, ND. At the invitation of then-prioress, Sister Kathryn Zimmer, Sister Agatha applied to a three-year formation program at Duquesne University in Pittsburgh, PA. She was accepted and earned a master’s degree in Fundamental Catholic Spirituality. After an initial stint working in formation, she accepted a position in the University of Mary placement office. Her attention to detail and organizational skills also proved valuable as subprioress for eight years under the leadership of Sister Susan Lardy and Sister Susan Berger. In 2000 Sister Agatha became a full-time formation director at Annunciation Monastery. She serves as novice director and chair of the initial formation committee. 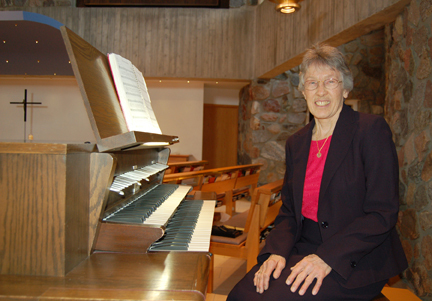 She compares her love of working in a flowerbed to the experience of seeing growth in people as well, saying, “There are definitely “aha” moments that reveal genuine growth in a person, rather than just compliance with expected behaviors.” Her additional ministry includes planning liturgical celebrations and playing the organ during prayer and Mass. “As life has gone on, I have come to appreciate and prize the rich dimensions of community life. I cherish the liturgical life a great deal; prayer and Eucharist enhanced through music.